Graduation Stamps For Your Graduation Invitations and Announcements. Easily Include Your Senior Portrait. Add Your Text. Make your personalized graduation stamp with your name, date and/or your photograph. It's easy. Simply click any stamp to discover the options. For every graduating level, Mickey Mouse dressed in his black cap and gown holding his diploma. 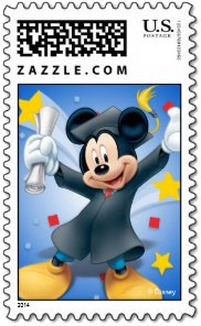 Wonderful Disney graduation stamp. A fresh look for your graduation Thank You cards. A swirly stylized treatment of a cap, tassel and diploma with your graduation photo framed in the center. Fun personalized graduation stamp. Fill the frame of this stamp with your graduate's smiling face and customize the year. 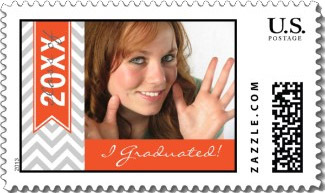 The tan colored text "graduate" in the foreground of this fun graduation announcement stamp. A modern and sophisticated graduation invitation stamp with a fancy cursive typographic overlay in gold. Easy to personalize with your photo and the personalized text of your choosing. Classy. This graduation invitation stamp has a dove grey chevron design. 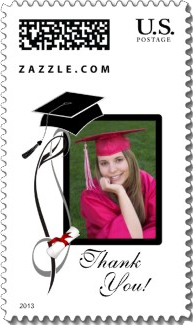 Easily personalize this graduation stamp with your photo, and all text. Available in a variety of colors. A simple and clean graduation announcement stamp design with a rolled diploma ties with a red ribbon and a dark blue mortarboard with gold tassel. This graduation announcement stamp has your photo filling the frame. A black banner at the bottom includes your personal text. Make different versions for graduation invitations and thank you cards. An elegant graduation invitation stamp or postage for your graduation thank you cards. Distressed olive green background with a cream ornate scrolls and swirls as a border. Easily add your photo and personalize the bottom two lines of text. Classic style. A classy personal touch to all your graduation announcements. A black and red photo template with room for your name and graduation year. Personalize to suit your needs. A photo cropped 5x7 fits best with this graduation stamp. 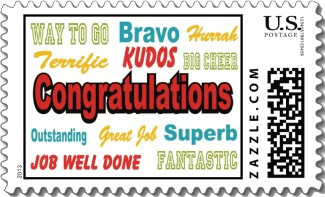 A fun graduation stamp with a retro look. Colorful graphic design of the many ways to say "Good Job". 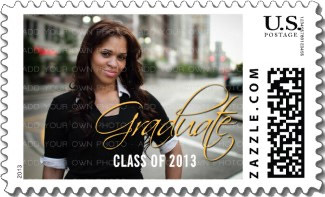 Personalize the year on this modern graphics graduation postage stamp. Make your graduation stamp in your school colors. You can also change the background and font colors by clicking the "Customize It" button. Elegant black and white graduation stamp with a wave of sparkling diamonds against a black background with the text "Graduate" in script. Personalized with the year. 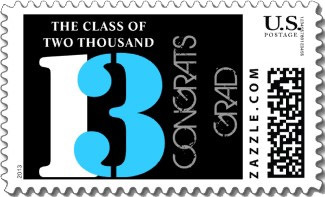 Add your graduate's photo to this graduation stamp and personalize the white text on a blue banner with his or her year of graduation. 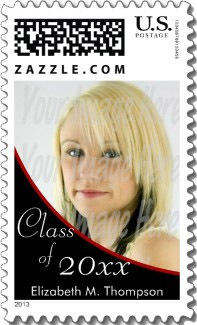 Easily revise all text and add your photo to this stylish graduation stamp. Modern and elegant photo graduation postage stamp with sleek borders in magenta and deco style embellishments in white. A thoroughly personal graduation stamp with a collage of four graduation photos against a black background. Include your grad's name and year. Easy and fun. 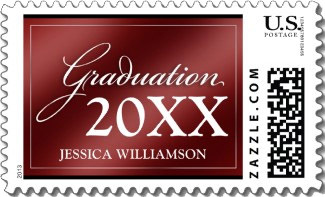 Modern personalized graduation stamp with maroon background. The text "Graduation" in white script with customized year and name below. Simple and stylish. Available in several colors. Personalize the red banner on this graduation stamp with your year and name. Attractive gray chevron fills the background. The blackboard motif of this graduation stamp fit with any announcement. 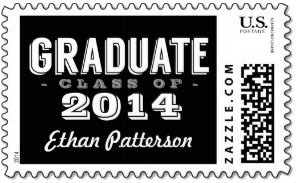 Easily personalize the year and name for a totally custom graduation stamp. Cute and fun graduation stamp with a stick man dressed in blue cap and gown jumping for joy. The text "MADE IT" stacked vertically. 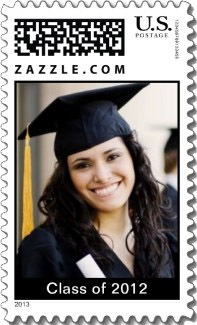 Elegant graduation postage stamp with diploma, cap and tassel. The text "Thank You" in black at the top. 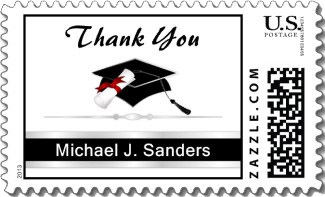 Add your name, or any custom text to the black banner at the bottom to create a personalized graduation stamp for your graduation thank you cards. The colorful and festive text "Grad Party" is surrounded by stars and graduation caps. 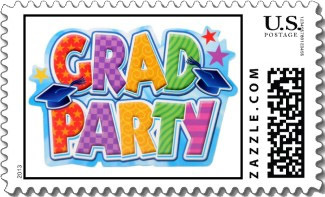 A fun graduation party invitation stamp for your graduation party invitations. A simple yet elegant graduation invitation stamp with personalized text for the year in a black stylized font and your graduate's name in a purple script font below. Unframed white background. A fun and casual graduation stamp. Customize with your grad's photo in the background. The text "grad" in a white script font in the foreground can be adjusted as needed.